Is a potato-only diet good for you? 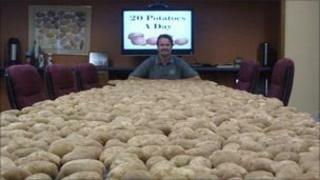 A man in the US has eaten nothing but 20 potatoes a day for the past two months. So, the Magazine asks, what does such a diet do to the body? Chris Voigt's reason for eating potatoes, potatoes and nothing but potatoes is as plain and simple as his diet has been for the past two months. As executive director of the Washington State Potato Commission, he's trying to debunk perceptions that potatoes are unhealthy and instead are a good source of fibre, potassium and vitamin C.
To that end, he's eaten nothing but 20 potatoes a day - no cheese toppings, no butter and milk for mashing - since 1 October. He's had them baked, chipped, boiled, steamed, mashed, fried - and for Thanksgiving last Thursday, he feasted on mashed potato formed into a turkey shape, and pumpkin pie made with - you guessed it - mashed potato with pumpkin pie flavouring added. Nutritionist Fiona Hunter agrees that potatoes have a bad rep. "Although many people think potatoes are nothing more than starch carbs, they are a surprising source of several vitamins and minerals. However, eating just potatoes will not provide all the nutrients needed for good health." Critics had warned Mr Voigt it would lead to weight gain, loss of energy and worryingly high blood sugar levels from all the carbohydrates. But in the course of his two-month diet, Mr Voigt himself says he has lost 18 pounds. His previously borderline-high cholesterol has dropped - down 52 points at the half-way mark. And the family food bill is down as he can feed himself for $15 (£9.40) a week. "Physically I feel great. Lots of energy, sleep good at night, no strange side-effects," says Mr Voigt from his office in Moses Lake, Washington state. "I'm not encouraging anyone to go on this crazy diet, nor would my doctor. This diet was just a bold statement to remind people that there is a lot of nutrition in a potato. "My doctor is interested to see the final results, and he suspected I would be just fine at the end of 60 days." While nutritionist Sue Todd wouldn't recommend such a diet, she says it has more going for it than some - especially if he was in reasonably good health to start with, and doesn't continue beyond 60 days. "Sailors on long sea voyages used to get scurvy, because they ate mainly starches from grain, which contained no vitamin C. Potatoes are a decent source of vitamin C, although they are not high in it. "Depending on how you restrict your diet, missing out on some vitamins affects you more than others. Variety is really important to get the nutrients our bodies need." It is an eating regime that's low in fat, which she approves of, and by eating a good proportion of his potatoes with the skin on, the fibre Mr Voigt consumes cuts the risk of one-side effect associated with restricted diets - constipation. But a potato-only diet provides none of the calcium and omega three - an essential fatty acid crucial for brain and heart function - needed for good health, says Ms Hunter. "The body needs 40 nutrients to function and no single food will provide all of these, which is why the nutrition guidelines from groups like the Department of Health stress that we need to eat a variety of food. "A diet of just potatoes will be deficient in vitamins A, E and K, the minerals calcium and selenium, essential fatty acids, protein and dietary fibre. Although they may provide enough iron for a man, they will not provide enough iron for women. "One way of addressing the vitamin shortfall would be to substitute white potatoes with sweet potatoes, which have more vitamin E and A." Mr Voigt did not take any multivitamins - something she says would help anyone undergoing this kind of regime. And when his diet ends, what will that do to his body? Ms Todd warns of possible digestive discomfort as his system readjusts. "He should ease himself out of it and not eat too much meat too soon, as it takes longer to digest." So what is Mr Voigt planning to eat once freed from his self-imposed diet? "I think my first meal is going to be a spicy beef taco, a glass of milk, a crunchy apple, and yes… roasted potatoes."